Can Software Reduce Patients’​ Out-of-Pocket Prescription Drug Costs and overall Medicare Prescription Drug Costs? Last month the Center for Medicare & Medicaid Services (CMS) released open data on Medicare Plan D. This led me to ask the question, “What are the top monthly prescribed drugs in America, how much are individual patients and Medicare paying for these drugs, and what role can technology play in bringing down these costs?” These are some of the questions Americans face when paying for and managing their medications. In the last 5 years, medication spending has risen substantially. 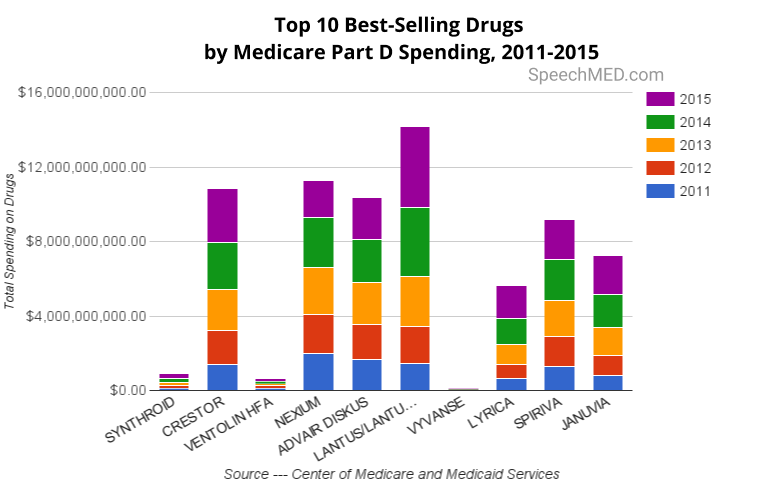 The largest amount of spending by Medicare Part D for the top 10 monthly prescribed drugs went to Lantus (Insulin). In 2011, Medicare spent approximately $1.5 billion and ended in 2015 with $4.4 billion. The drug that had the lowest amount of spending was Vyvanse. Spending was approximate $9 million in 2011 and by 2015 went up to an estimated $34 million. The spending for this drug increased by approximately 1.4% in sales each year following. 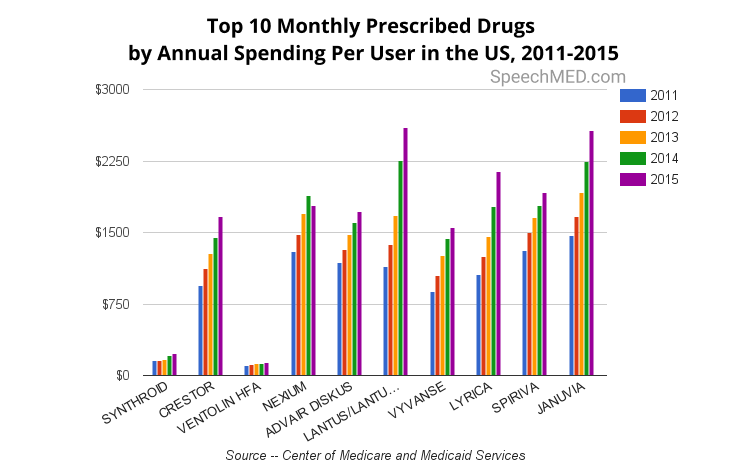 The cost of the top 10 monthly prescribed drugs continues to rise each year. If you look at the purple bars you can see that in 2015 the most expensive drug was Lantus (insulin), but on average the drug that cost the most was Januvia. It cost $1,974 annually for patients, which is about $164 per month. If we look at the shortest bars we can see Synthroid and Ventolin were in the running for least costly. The lowest average cost of a drug over the last 5 years was Ventolin HFA which was $122 average. Imagine if you were a patient with a certain percent of your drug covered by Medicare. It might be a shocker that your drug that in 2011 cost $95 a month now has shot up to $217 a month in 2015. Especially if you have to pay out of pocket. The cost of Lantus (Insulin) is growing by an average of 23% each year. The rising cost is an added burden for patients who are diabetic because according to Diebetes.org they are already projected to spend up to $13,700 on medical expenditures. To make sense of the state of prescription drugs, I reached out to Dr. Ali Khoshnevis, Chief Health Officer at Tesser Health. Dr. Khoshnevis is an Optometrist and in 2011 co-founded the app WeRx.org to help people compare their prescription prices. The app has proven stories of impacting patients lives. In our observations, Insulin did rise in costs for Medicare in 2013 the cost per user was $1,679 what Dr. Khoshnevis mentioned was the out-of-pocket cost patients have to pay. Why is this happening? According to DiebetesForecast.org, this is happening because drug prices are not regulated. In addition, lack of competition means drug companies can set the price of drugs. Can Technology Help Reduce Out-of-Pocket Costs? What about Overall Medicare Spending? In the chart above we use Medicare’s 2017 coverage gap to illustrate the out of pocket cost that a person would pay and applied it to the cost of Insulin over 2011-2015. For Medicare users, once you and your plan spend over $3,700 you will be in the gap. Beyond that, you will have to pay 40% of the cost for brand-name prescription drugs and 51% of the cost for generic drugs. Software that aggregates prescription data and shows it in a simple interface for users will help patients save money. What we can learn from this analysis is that while Medicare may subsidize some of the payments there is still a heavy burden on the average American to afford prescription drugs. Software is enabling people to compare costs and has the potential to help medicare reduce spending. Because drug costs are not regulated the cost of life-saving drugs like Insulin can skyrocket leaving patients in a tough position. I anticipate that as the cost of drugs continue to rise companies that design software to serve people and organizations will become more important in the discussion of drug price regulation. *Shoot me an email and I will send you a link to the Medicare data I used. 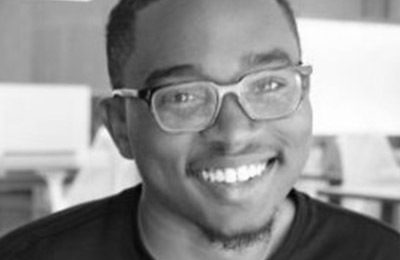 Gregory is a part of the Growth Marketing Team at SpeechMED, a multi-lingual healthcare engagement and informatics platform that’s powering hospitals and helping patients. Who is Adopting Patient Engagement Software? Our mission is to make a patient’s medical information understandable to them regardless of their age, vision, language preference, or literacy levels. Copyright © 2017 SpeechMED Inc.